St. Mark's Square Venice Piazza San Marco, is the principal public square of Venice, Italy, where it is generally known just as "the Piazza". All other urban spaces in the city are called "campi"
Very detailed and vivid colors, frame included. Canvas, Wrap Around Canvas, Flat 1/2 " Framed Canvas, or modern look Acrylic Plexi Mount. 36"x24" Original Art Work oil on Canvas, Framed -Sold. 36"x24" Canvas Wrap Around Giclee No Frame $390. 36"x24" Acrylic or Plexi Mount $690. 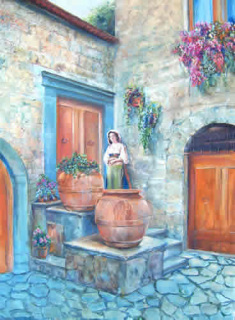 This Original Painting dimension 30" x 24"captures the Italian motive. 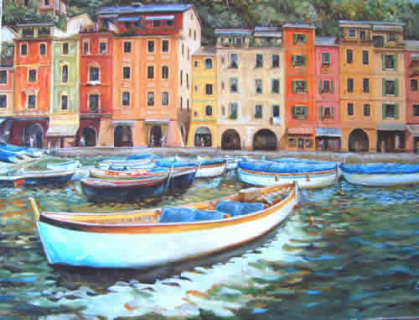 Portofino: 36" x 24" Oil On Canvas Painting Framed, $1,990. This Original Painting dimension 36" x 24"captures the Italian motive. Detailed in vivid colors, frame included. 36" x 24" Oil On Canvas Painting Framed, $1990. 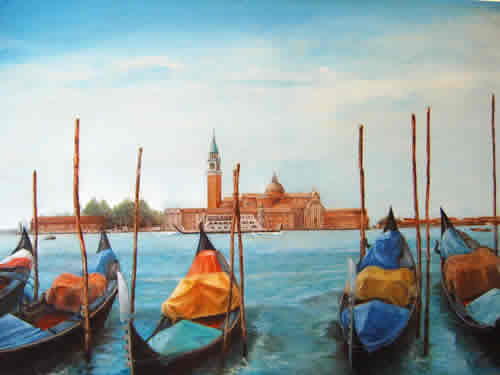 36"x 24" Canvas Wrap Around Giclee No Frame, $220. 36″ x 24″ Canvas Giclee with Frame $290.